In exactly one month, my second grand-child is due and I cannot wait to meet him. And of course, you know I was going to have a quilt ready for him when he finally got here! His parents decorated the nursery with a nautical theme... lots of blue and grey with a touch of red and chocolate brown. As soon as I got the theme and the colours, I spent some time on Pinterest to gather inspiration and then got my paper and markers out to come up with a design. I then texted the design to my daughter-in-law to make sure something like this is what she had in mind and she loved it! I knew I'd be able to find everything I needed right in my stash so started "shopping". I pulled some Kona Silver for the background, three different blue fat quarters, two red ones and a brown one. I figured out the piecing for the sailboat and the fish myself (they were both pretty easy) but for the anchor, I used this tutorial by the Hopeful Homemaker. I thought wavy lines would be perfect for a nautical quilt so used my walking foot and some Aurifil thread in Dove (#2600). The baby shower was on Sunday, July 16 and I'm happy to report that the mom-to-be was absolutely thrilled about the quilt. I'll be linking up at Crazy Mom Quilts for Finish It Up Friday and at Pretty Piney for TGIFF. Last week, Lucy who blogs at Charm About You released a new pattern: A Piece of Me Pouch. I read about it on Saturday (I do all my blog reading on Saturday morning while drinking my coffee) and right away purchased a copy of it. We were celebrating my step-daughter's birthday on Sunday so I decided this little pouch would be the perfect gift for her. Her favourite colour is purple so I pulled out two purple fat quarters and got to work! This was a super easy and fun make! I picked a fun stripe for the binding to finish off the pouch and love how it looks. The pattern says to hand sew the binding to the back but I'm not a huge fan of hand sewing so I tried to sew it on by machine. 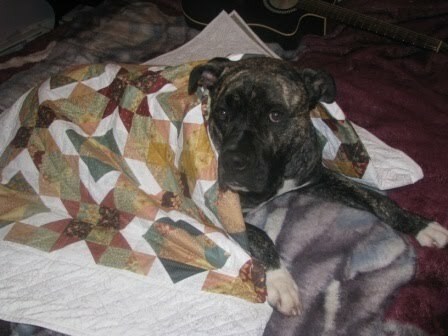 I basically used the same method I use for my quilts. It didn't turn quite as nice as I thought it would but it definitely not so bad that it needed to be unpicked! Cheryl from Meadow Mist Designs launched her 4th mystery quilt along recently. This will be my 3rd time participating - you can see my Midnight Mystery quilt here and my Meadow Mystery quilt here. Last year, I was a little disappointed with my fabric choices so I told myself I would do the "un-mystery" version this time around. But in the end, discovering the design a little bit at a time is too much fun. Also, Cheryl provided some really good examples and kits for different fabric combinations which made me feel a little more confident picking good fabrics for my version. I'm doing the queen size version so that's a pretty large stack of fabric right there! My fabric A is Carolyn Friedlander's Crosshatch in Creamsicle. My choice for fabric B is Lace Elements in Plum by Art Gallery. I went with Kona Charcoal for fabric C and Carolyn Friedlander's Doe in White for fabric D. I love the really cool tone on tone print and I think it'll look pretty nice as my background. The next set of instructions will be published on the first Thursday of August so on August 3. I can't wait to get started! I feel as though my "day job" really interfered with my quilty accomplishments during quarter 2 of 2017. Lots of hours spent at work means less hours spent at the sewing machine. 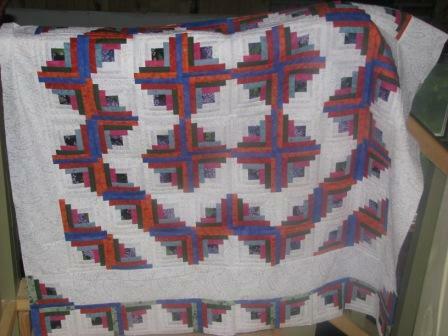 So I wasn't very successful with my Q2 FAL list - out of 3 projects, I only managed to finish one (my Missing the U quilt). But I'm hoping for a lot more free time over the next 3 months so here is my Q3 list. This one has been on my list for far too long now - it has to get done. It seems as though no matter how many scrappy projects I put together, the scraps just keep coming. I would really love to put a dent in my green scraps by making an entire quilt out of green modern log cabin blocks. A couple of months ago, my son Max asked me if I would teach him how to quilt. Little did I know that he already had a project AND a recipient in mind for his first quilt. He came up with a lot of the design, ordered the fabric and pieced almost all of it himself. We now need to put on a couple of borders, baste and quilt it! 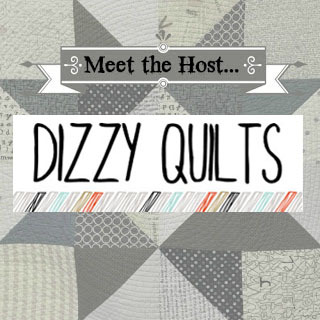 I was totally inspired by Debbie from A Quilter's Table when she shared her FAL list for Q3. She has the most beautiful scrappy improv quarter log cabins on there! And she even has a tutorial for these blocks. I was playing with my scraps the other night and put this one block together and I think I like it! Now I have to keep playing and maybe even sew a whole bunch of blocks. When I made a lunch bag for my friend Debbie, I realized the one I had made for myself wasn't nearly as nice so I decided to make another one. This time, I'm using Essex Linen for the exterior and a Kona blue for the accent fabric (can't remember the colour). The exterior is almost done so this should be an easy finish this quarter. That's it for this quarter. You still have one day to link-up your list here on my blog or on the blog of any of the other global hosts! It is very helpful if you tag your list as #2017FALQ3yourname when posting on social media: Flickr, Facebook and Instagram. Using the same hashtag over the quarter when sharing progress or finishes before the link, helps the hosts find your original list quickly - especially when this is done over a 3 month period. IMPORTANT: Don't forget to link your finishes up when the quarter closes.